Wednesday, May 15, 19.30 - 22h. Doors open at 19h! Welcome to an inspiring unforgettable chanting evening with Kevin James Carroll. 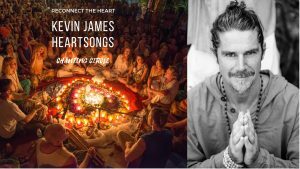 Join us for an evening of connection, community spirit and singing of Heartsongs and Mantras with Australia's own world traveling chant leader Kevin James Carroll. The Chanting Circle is an empowering and co-creative experience that can have you singing your heart out, dancing in bliss and diving deep into the profound silence that follows. Early Bird ticket, limited number: 22euro SOLD OUT! !